How do you make your Izannah Walker doll heads. I have only made fabric dolls and china dolls. I am use to working with molds. Izannah used molds to make her dolls. Do you know anyone who has taken molds from original dolls? How do you learn to mold fabric or work with paper mache? The answer is really quite simple. I make a cloth doll, then I gesso (artist's primer) over the head and shoulders. Then I add paperclay in thin layers. I bake it in the oven at 200 degrees after I add each clay layer. With each layer I build up areas by hand sculpting. When it's where I want it, I sand and prime it with gesso again. Then I paint the head with many layers of underpainting and overwashing with thin glazes. I've been doing this now for about a year and a half and I learn something with every doll I make. 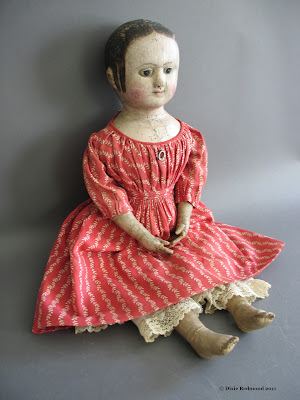 I also learn by looking very closely at pictures of original Izannah Walker dolls - looking at the profiles, etc. That's why when I took pictures of the dolls at right I took pictures of how joints come together, profiles, tops of head, feet - how the bottom is constructed, etc. So it's that easy and it's that hard. My own dolls are hand sculpted one of a kind works. It would be very hard for me to make replicas, because I'm really not that disciplined ;-) You learn by doing. As you learn by doing you will begin to develop a kind of vocabulary that makes your work unique to you. There are so many people who make wonderful Izannah inspired dolls out there - some of them really come close to catching the feeling of an original, and others are more "inspired by". I put my own dolls in the "inspired by" camp, and I'm fine with that. 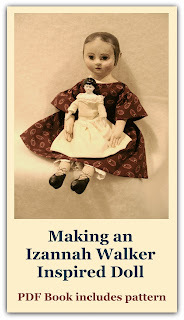 I haven't heard of anyone who has taken molds of an original Izannah Walker doll, but it's possible that someone has. This is such an amazing blog - thank you for taking the time to compile so many great photos, links, and bits of information!